Today on the feast day of St. Cyprian and Sta. Justina on the 26th of September Sacred Alchemy Store is offering St. Cyprian of the Black Cat Bone as our offering in honor of this enigmatic and precious saint, patron of necromancy and one of many saints dressing well the garments of folk Catholicism. The charge has been made in the course of the nine days of Cyprian, prayers to the left and to the right along with anointments and fumigations at midday and midnight hath been done to bring in the Sun at midday and the Sun at midnight to enforce the feline sorcerous juices resting within this icon balancing the Sun both white and black equally. And in truth the black cat bone is not a metaphor here, but the nail that serves as the axis for this sorcerous offering and carried within the saint. St. Cyprian is amongst those powers that those of us from the old persuasion might deem a ‘witchcraft saint’, a terminology that tend to generate a great deal of resistance amongst contemporary practitioners of occultism and paganism simply due to a Catholic bias rehearsed in a disenchanted postmodern reality saturated with opinions and truism that can never hope to be anything but an echo of lies. Some would argue that Christianity is anti-paganism, yet, a term like ‘the old faith’ or ‘old religion’ was in truth, as Emma Wilby stated, in her erudite studies about the Cunning folk on the Isle of Albion, a reference to Catholicism in the time of reformation. The Catholic Church or more correctly The Roman Catholic Church was a continuation of Roman ways, mediated this ‘new’ vision ascribed to Ieshua then adopted as a prophet for a particular way of interpreting theology and theophany in a Catholic or Universalist way. Certainly a lot has changed since then and the Roman Catholic Church went through several schism and reformations in itself. Christian saints might be seen as similar to the sadhus of India and the prophets of Islam and Judaism pertaining to the Christian mythology, where saints continued metaphors, allegories and teachings either born by their own example or continuing legends like genii loci related to the magic and mystery of a specific location. A saint is not ‘something Christian’, a saint is also something dead, something vibrant, and something that holds a particular virtue – and in the case of St. Cyprian wespeak of the virtue of necromancy and magic. The magic of the Eucharist, of sacred and barbarous words, the virtue resting in plants of healing and how to raise the dead to speak, in the manner of Ieshua himself allowing Lazarus to raise from the grave in the manner of St. Cyprian rising the dead and cause death to speak. Beneath the Christian veil, a saint will always carry a naked truth, a virtue that can be recognized for what it is, no matter if the virtue is dressed in a bishops cloak, the rags of a beggar or the leaves of nature. A saint can be ancestry, virtue and genii loci, metaphor, allegory and memory. For more about this, please do read the article about Sorcerous Saints. And so, it is with great pleasure we offer 2 – two - St. Cyprians which will be finalized in this night up for sale. This St.Cyprian carries a powerful and unique sorcerous charge utilizing the black at bone as vehicle for its necromantic potency. 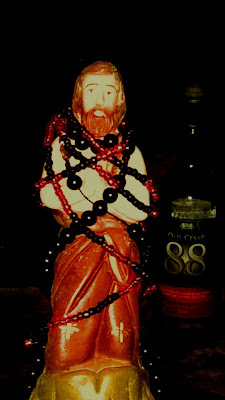 Along with the saint comes a guia of Exu washed in honour of the ‘left’ and a black rosary, this one dedicated to another sorcerous saint, São Bento, that mimics the mystery and shock embedded in the icon of St. Cyprian and a secret prayer bringing in a strong Saturnine river to this Sun at Midnight.